Despatches From the Querying Trenches. Kirsten Looks Back at February. It's the beginning of March and that means it's time for Kirsten to share her monthly round-up of what has been happening in her writing world. Her blog this month is about a subject dear to my heart - the friendship of writers. My, that month has rolled around quickly and what a busy one it’s been in the Hesketh household. Husband and son returned from a brilliant holiday in Patagonia. Son squeezed in a couple of university interviews and then set off interrailing. Daughter turned sweet sixteen complete with obligatory birthday ‘gathering’. Husband turned fifty-something and complete with a different type of birthday gathering! And as for me? I’ve been editing, editing, editing. And had an endoscopy! Seriously, though, it’s been a great month writing wise and - drum roll - I’ve nearly finished my edits. I reckon I’ll be in a position to (re)submit when I go on a writing retreat in a couple of weeks’ time. I know there’ll be plenty of wine, cake, tissues and moral support on tap there to cover every eventuality. But the highlight of my February writing life has been helping three - three! - lovely writerly friends celebrate the launch of their - very different - books. I’ve said it before and I’ll say it again - writers really are the most friendly, supportive and inclusive bunch and one of the best things about starting to write has been all the new friends I’ve made. On top of that, seeing my friends’ dreams coming true is incredibly motivating and inspiring as I navigate the querying trenches. I met Moira Please on Twitter. Despite continually telling my children to be wary of people they meet online, Moira and I have become good friends. Moira writes romantic comedy as Maddie Please and her second book, A Year of New Adventures, is just out. 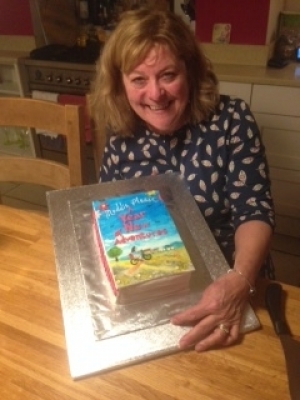 When Moira came to stay a couple of weeks ago, I got my clever friend Debbie to make this cake for her. Isn’t it fabulous? AYONA is billed as the perfect feel-good summer read but I’ve just devoured it in front of the fire over a couple of snowy days. At one point, my unladylike snorts of laughter made my husband come into the room to see what was going on. Fantastic stuff. The lovely Claire Dyer critiqued the first three chapters of my WIP and then invited me to join Reading Writers and has now become a good friend. 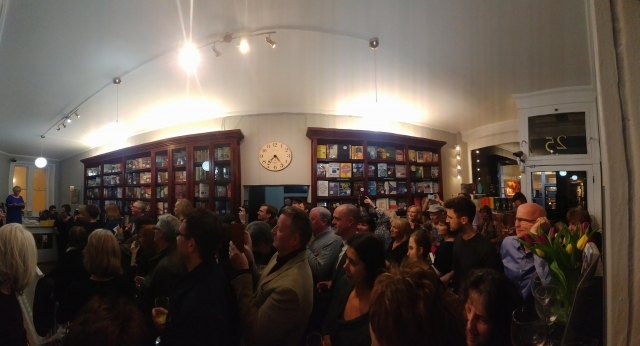 Claire’s third novel, The Last Day, was launched on February 15th complete with launch party at the fabulous Goldsboro books just off St Martin’s Lane. Generally, I like to blend into the background at such events but I was running late after taking my son to one of the aforementioned university interviews and I arrived as just as Claire was mid-speech. (Sorry Claire!). I tried to sneak in unobserved but Claire interrupted her speech to say, ‘oh look, it’s Kirsten’, and all the people in this photo turned to look at me. I think my face went as red as the coat I was wearing! It was a fantastic launch though - loads of drink, a fab venue and lots of interesting people. I can’t wait to get stuck into The Last Day: I love the way Claire writes - she’s also a poet and there’s always a real tenderness and elegance to her prose along with fantastic characterisation and a cracking story. Amanda Berriman and I met at a writing retreat in Derbyshire and bonded over a game of literary consequences that involved Limoncello, Curly-Wurlies and ‘Moira’s-got-an-agent’. I think I remember laughing until I cried. 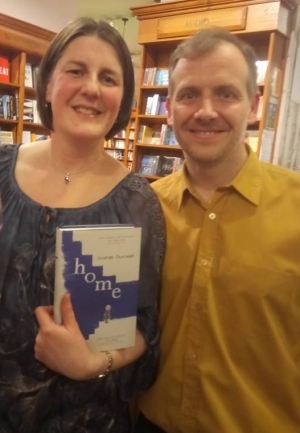 Mandy’s debut novel, Home, has just been launched to great acclaim and has been reviewed in the Guardian and - so I’m told(!) - the Daily Mail. I was thrilled to be invited to the launch which took place at another lovely shop - Daunt Books on the Fulham Road. It was a blast - so many writers I knew in person and from Twitter, lots to drink and moving speeches from Mandy and her publisher. Home is right at the top of my TBR pile: it sounds an amazing and an important book - the story of a vulnerable family narrated by four-and-a-half-year-old Jesika, who tells us, in her language, what she understands - and doesn’t - of her world. I’m so happy for and proud of Moira, Claire and Mandy and, all in all, February has been a fabulously inspiring month. And remember, fellow aspiring writers, one day it could be us! I hope you all have a wonderful March – spring must surely be just around the corner now! I can't believe it's taken me so long to get around to reading this! Fabulous and absolutely true. Writing friends are amazing, such an unexpected bonus to throwing oneself into the writing world. Well done for getting to the end of your edits, Kirsten. I agree with you that meeting up with other writers (new and old) is a tonic. Maddie got CAKE!! wow What a lovely friend you are! Actually it is incredibly inspiring to have friends publish - and writers ARE very supportive of each other. A lovely post, Kirsten. As always. What an exciting and inspiring month February has been for you, Kirsten - and for the literary friends you have highlighted in your post. I am so glad all is going well with your own literary adventure. It must be so exciting and absorbing to be making your way along this path. Warmest best wishes to you and your inspirational family. Jan, I'm glad you enjoyed Kirsten's blog. Friendships with other writers is what sustains us. Our writer friends see us through the disappointments and they are there to celebrate with us when success comes. Christina, lovely to hear from you. Yes, it is a joyous post, isn't it? We're all looking forward to sharing in Kirsten's success as well when it comes. Tara, I agree - it is wonderful to see friends enjoying their well-deserved success. Good luck with your edits. I love editing. I know you have been avoiding starting yours, but I hope you find you love it too. Maddie, it's lovely to see your photo in Kirsten's blog. That cake is just fantastic. Catherine, you're right - we will be celebrating Kirsten's success in the not too distant future. Glad you enjoyed her guest blog. What a lovely post, Kirsten. I agree with you that being able to celebrate friends’ writing successes and book launches is inspiring. Friendship from other writers is invaluable, isn’t it? Good luck with the editing, editing and more editing! What a joyous blog post! You've certainly been busy lately. Congratulations to Maddie, Claire and Mandy on the publication of their books. I'm sure we'll be celebrating your success before too long, Kirsten! What a busy month you’ve had. I love it when my friends realise their dream and publish their books. And yes, I still cling to the hope that one day it will be me :) Great news about your edits, I’m still just starting mine (or rather I have been avoiding starting mine).